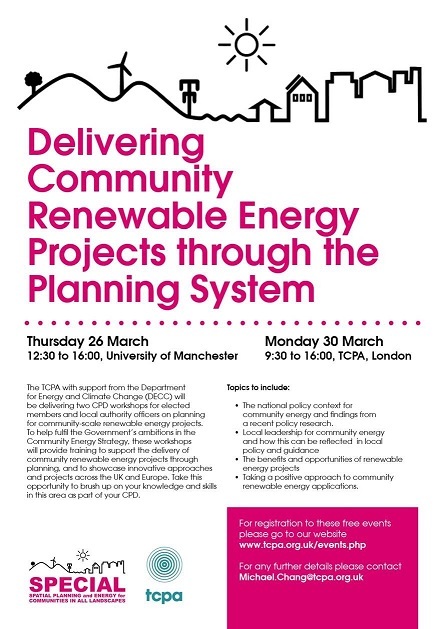 This free event focuses on improving elected members and planners' skills and understanding of planning policy and delivery issues to support local leadership in decision-making on community renewable energy projects. Community energy has an important role to play inincreasing domestic low-carbon energy generation and in encouraging reduced energy demand, however, the general level of awareness of the link between spatial planning and community renewable energy deployment remains low. Planners, communities and politicians are all key players in the planning process, and embedding effective policy in local plans supported by an understanding of the concepts of community ownership is an important step forward that local authorities can take. The planning process is a key gateway through which community renewables projects need to pass. However, barriers still exist for community led projects related to the availability of technical support, and the priority afforded to community energy projects in plan making and decisions. To help fulfil the Government’s ambitions in the Community Energy Strategy, these workshops provide training to support the delivery of community renewable energy projects through planning. The Town and Country Planning Association (TCPA) are delivering two planning workshops for local authority planners, officers and elected members in Manchester and London. Local authority planners and elected members, plus officers from strategically linked departments dealing with matters such as climate change, energy, regeneration, community engagement and housing. Priorty registration will be given to local authorities and those from public agencies and community-based organisations.